New location in Seattle, 2017 program dates, locations and early registration discounts (click here to view). The new location in Seattle will be held on the scenic campus of Seattle University located in Seattle’s bustling and entertaining Capital Hill neighborhood. Nashville will be held on the beautiful campus of Middle Tennessee State University – Murfreesboro just outside the Music City with the Grand Ole Opry and legendary Music Row and other attractions. The San Diego location will once again be held on the beautiful campus of California State University – San Marcos and is easily accessible from San Diego, Los Angeles, and Orange County with California sunshine and beaches nearby. Toronto’s session will be held in the beautiful suburb of Oakville at Sheridan College near Lake Ontario with the world class city of Toronto minutes away. All of the locations offer fantastic modern facilities including spacious classrooms, an outstanding performance theatre, practice room units, suite and apartment style accommodations, exceptional dining facilities, and more. The program’s administration has been organizing and directing summer music workshops across North America for fifteen years. The program has been sold out the last few years running and musicians of all ages and levels have been attending from across Canada, the U.S., Europe, South America, Asia, and Australia. Considered by most to be the premier summer music education program in North America, the program has been offering workshops in Toronto and Vancouver for many years and has now expanded to the U.S. due to popular demand. On campus and off campus tuitions are available and registration has already begun for the 2017 sessions. 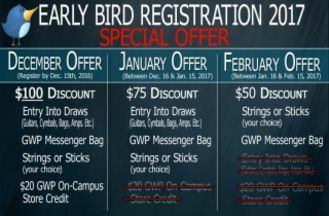 For a limited time, there are early bird registration offers where participants can save on tuition and be entered into draws to win great prizes such as guitars, amplifiers, gig bags, cymbals, and more. Most sessions have sold out in the past, therefore, people register early to avoid disappointment. Guitar Workshop Plus announces dates, locations, discounts, and more!